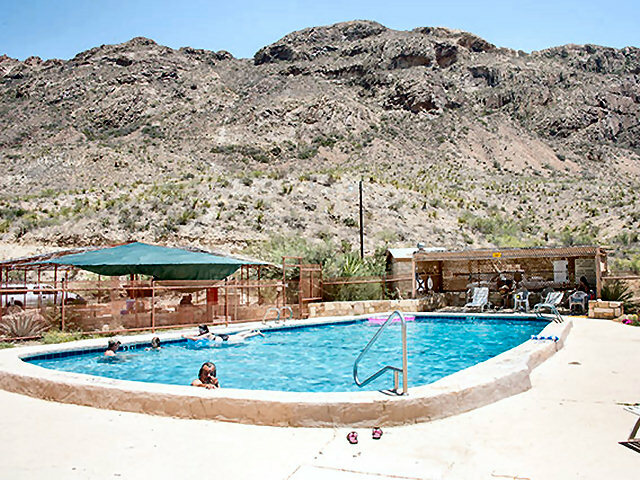 A Texas Big Bend resort with swimming pool, showers, laundrymat and more. “There are very few places left where you can enjoy wide open spaces in peace and quiet – Terlingua Ranch Lodge definitely is one of those.”–Disco D.
Terlingua Ranch Lodge is a Big Bend resort with conveniences that include Wi-Fi, a swimming pool, bathhouse with showers, laundrymat with washers and dryers, and a cold storage deer/meat locker for hunters ▶️. Our pool is a rare pleasure in the desert. Open from 10:00am to 10:00pm seven days a week with adjoining cabana patio, fire ring and large BBQ pit, it’s the perfect place to unwind with friends, family and guests. The Bad Rabbit Cafe is next door with food and beverages. No glass is allowed inside pool fencing. 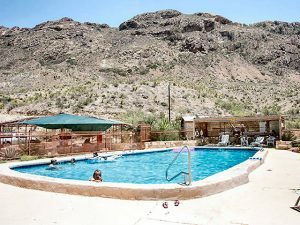 Swimming pool use is included with each room, RV or campsite rental. If you are not a guest at the Lodge there is a $25.00 season pass for POATRI members in good standing or otherwise a $5.00 fee per person per day. 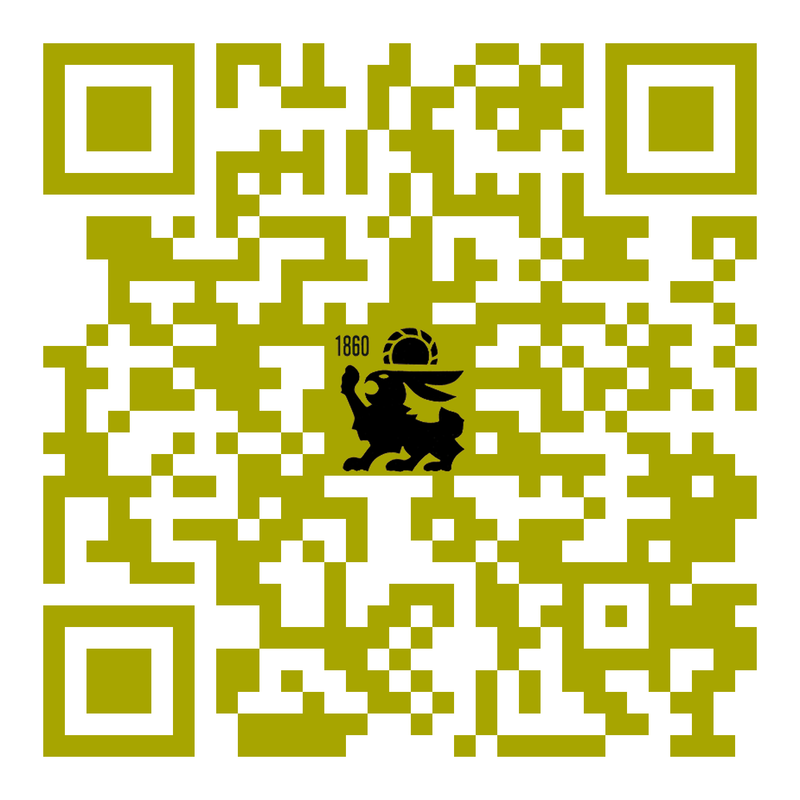 Pass keys are available at the office. After a day of fun in the desert, enjoy a hot shower in our men’s or women’s bathhouse facility. Open 24 hours year-round. The bathhouse is located next to our swimming pool. Use of the bathouse is free for all guests. 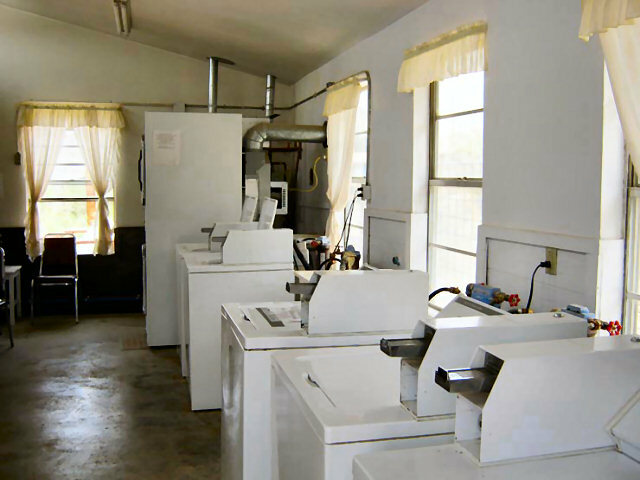 The laundry room has several washers and dryers available from 10:00am to 10:00pm every day. Modified hours during Spring Break and holidays are 6:00pm to 6:00am. Because of mineral content in well water, we recommend saving your whites for when you return home. The cost is $2.00 per washload and $0.25 increments for the dryers. Bring quarters! Our cold storage locker is open during official Texas hunting season or special events. 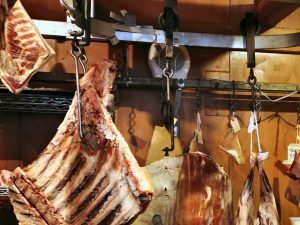 There is a $25.00 fee per animal for storage. 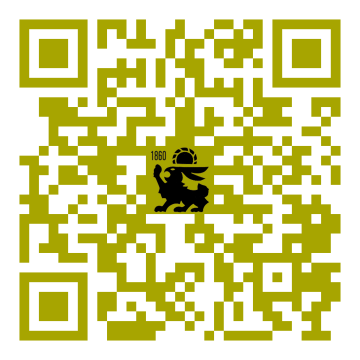 Game requires a hunters registration tag. Our office checks for a license but not a permit. 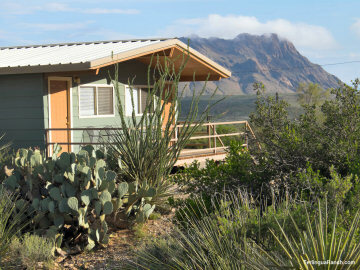 Terlingua Ranch Lodge resort is a uniquely remote Far West Texas Big Bend vacation lodging, holiday getaway travel destination and pet-friendly hotel/motel/inn alternative featuring (a) rustic cabin guest rooms, pull-through and back-in RV sites, tent campgrounds, and horse accommodations, (b) a convenient airstrip, restaurant/cafe, swimming pool and other amenities, (c) engaging on-site or nearby activities and entertainment e.g. 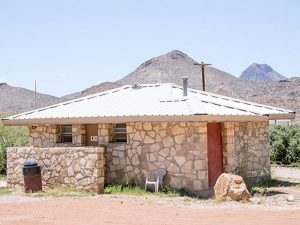 ATV/ORV exploring, hiking, biking, motorcycle and horseback riding, and stargazing, and (d) stunningly scenic attractions such as Big Bend National Park, Big Bend Ranch State Park and the Christmas Mountains.